So now that the leotard is here and covered (Read about the leotard here) I can move on to the fringing! The first very exciting bit! 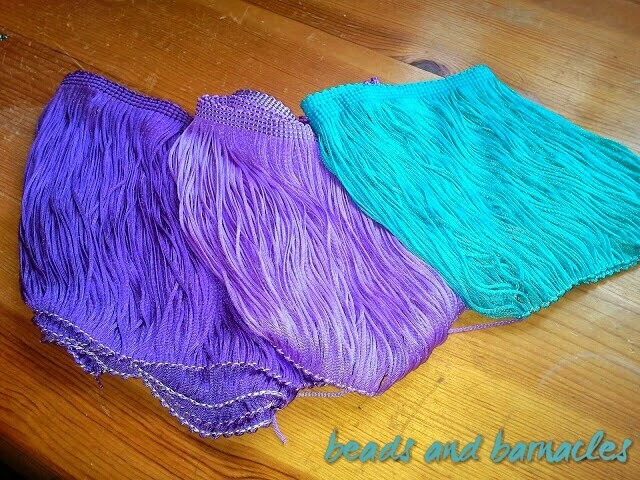 Here are the colours of fringing that I got, I am very pleased with how well the colours go together. I bought 15cm tactel fringing from DSI and Chrisanne, it was reasonably pricey, but I am saving money by making the dress myself, so I thought I can spend a little more on the materials. 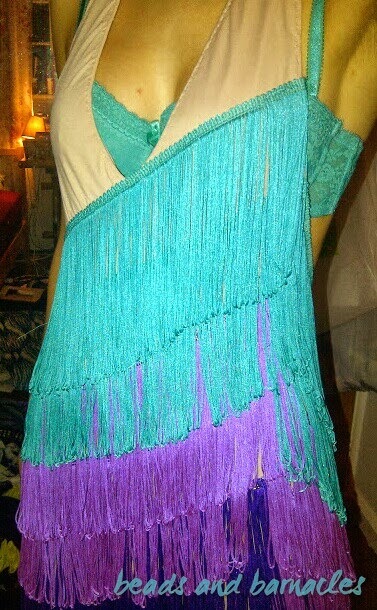 The first step was positioning the fringe on the dress and pinning it in place so that you can visualise how it looks. I went for diagonal lines across the front, which went round to the low back of the dress and then came back up the side to allow the next line to follow the pattern approx. 7.5cm below (half the length of the fringe). After pinning the fringe on the next step is to sew the fringe across the top. It is important that the stitching is secure, as it prevents the fringe loops from slipping and becoming uneven. The fringe is provided with the bottom of the fringe ‘sewn’ together, making it easier to work with. This will be removed once the fringe is all stitched in place. 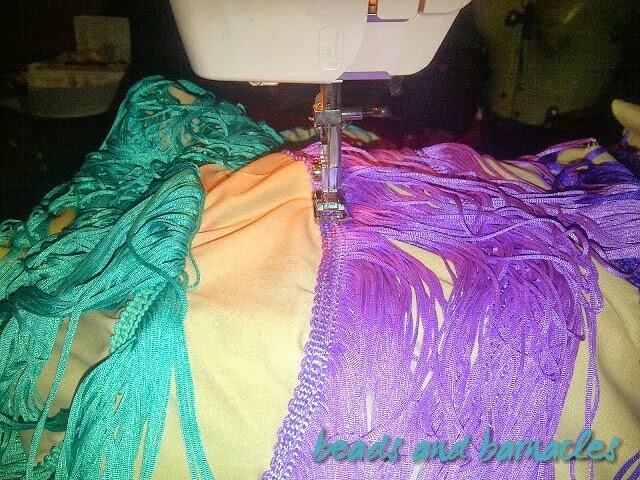 To sew the fringe on I used jade/ light purple/ dark purple thread respectively and a narrow zigzag stitch. You can see that once the fringe is sewn it looks much neater on the leotard. The first few layers I stitched through the outer leotard and the base leotard, but lower layers I did not want stitched through the base layer as it would cause the skirt section to get hitched up. This was slightly awkward as I had to stop sewing part way through a layer and rethread the dress onto the machine with only the outer layer being stitched. But I’m sure it will be better in the long run! After the 2 layers of jade I switched to the light purple, having the join at the highest point in the fringe. After 2 layers of light purple I then put 2 layers of dark purple. On the lower layers it was important to not stretch the lycra too much as it would distort the skirt. If I do this again I would change the fringe I used to be elasticated fringe instead. (at least in the top layers) because it would make getting into and out of the leotard much easier! Next step is all the embellishment. Here come lots of sparkly rhinestones! Is the fringing used here really thick as single layers? or did you need to layer them twice to get the thickness? The fringe I used is double looped fringe so it gives two layers of fringe for each layer of header. This is the same as most of the stuff from Chrisanne or DSI, but if you sourced fringe from somewhere else it might be thinner. If you had thinner fringe then you could either sew two layers on at the same point (this might give you fairly bulky attachments though) or just space the layers closer together, which would give a fuller fringe appearance.